Labor leaders called Friday for a more progressive state tax system and greater investments in Connecticut’s cities to revitalize the economy and stabilize the budget. 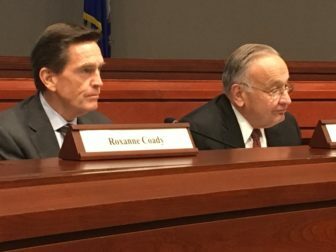 Testifying before the state’s Commission on Fiscal Stability and Economic Growth, union officials also said Connecticut should boost the minimum wage from $10.10 to $15 per hour, close the gender pay equity gap, enforce sales tax collections on internet transactions and penalize big employers that steer their workers onto state-subsidized health insurance and food stamps. Also Friday, leaders of the study panel rebutted one labor group’s charge that the commission is predisposed to favor business. “Since the inception of the state income tax” in 1991, “the income tax avoidance industry for the wealthiest taxpayers has flourished,” said Donald Williams, executive director of the Connecticut Education Association, the state’s largest bargaining unit for public school teachers. “Success in shielding or hiding income from taxation has affected the national treasury as well as Connecticut’s coffers,” Williams added. Union leaders said Connecticut should support New York Gov. Andrew Cuomo’s “fairness tax” plan. Cuomo has proposed that his state and four other northeastern states with strong financial services sectors — Connecticut, New Jersey, Pennsylvania and Massachusetts — impose a special state income tax rate of about 17 percent on hedge fund manager compensation. This would reflect the difference between the 20 percent federal capital gains income tax rate imposed on these earnings in 2017 — and the 37 percent rate most would face if they were taxed as ordinary income. “What we need today is bold and comprehensive tax reform,” Williams said, adding that Connecticut’s tax system is outdated. In 1991, just before legislators established the state income tax, Connecticut taxed large earnings tied to capital gains and dividends as high as 7 and 14 percent, respectively. But once the income tax was established, nearly all earnings were subject to the same, flat 4.5 percent rate. In other words, wealthy households with huge investment-related income received an enormous state tax break. Even at present, 27 years later, the top marginal rate on the state income tax is 6.99 percent. 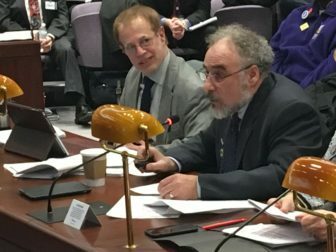 Commission members pushed back that many legislators, business leaders and others believe wealthy residents are fleeing Connecticut in response to state taxes that rose significantly in 2011 and 2015 — and may do so again in the coming years. “We want to make sure we are protecting the wealthy because they will just leave,” said commission member Cindi Bigelow, CEO of Bigelow Tea. Jim Smith, one of the panel’s co-chairs and the recently retired chairman and CEO of Webster Bank, said the state “is in fundamental economic decline.” Connecticut has recovered fewer than 80 percent of the jobs it lost in the last recession, which ended eight years ago. And since that time, its economic recovery has lagged both the Northeast and the nation. The panel is charged with helping the legislature chart a course to a better economic recovery while Connecticut also faces surging retirement benefit costs expected to place considerable pressure on state finances for the next 15 to 20 years. The head of the largest state employee union and the chief negotiator for the State Employees Bargaining Agent Coalition agreed that the state’s economy needs help, but disputed that shielding the wealthy needs to be part of the solution. “When I drive through Wilton or Greenwich, I don’t see a lot of blight,” said Salvatore Luciano, executive director of Council 4 of the American Federation of State, County and Municipal Employees. Hartford attorney Daniel Livingston, who bargains for all state employee unions on benefits, cited a 2016 study by Stanford University and U.S. Treasury analysts. Livingston and other union officials said Connecticut would become more attractive to all income groups, including the wealthy, with a more progressive tax system and a government that invested these revenues into urban centers, education and transportation. 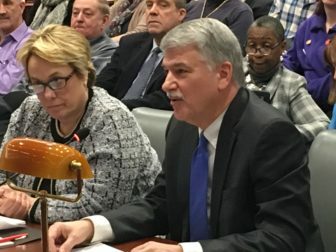 AFL-CIO President Lori Pelletier repeated her concerns Friday that the commission, which must submit recommendations to the legislature by March 1, already had embraced calls from the business community and municipal advocates to weaken collective bargaining and curtail benefits for public sector employees. “Business and labor may be adversaries at the bargaining table, but we are not enemies,” Pelletier said, adding that income inequality, not labor, is undermining the state’s economic recovery. “It’s sort of Economy 101,” she said. “The more money people have to spend,” the faster the economy grows. But both Smith and the other co-chairman, health care executive Robert Patricelli, insisted their panel is far from predisposed against labor. Smith added labor, business and government need to work together to solve Connecticut’s challenges. “The idea is to come as close as possible to solve the problems we both know exist,” he said.